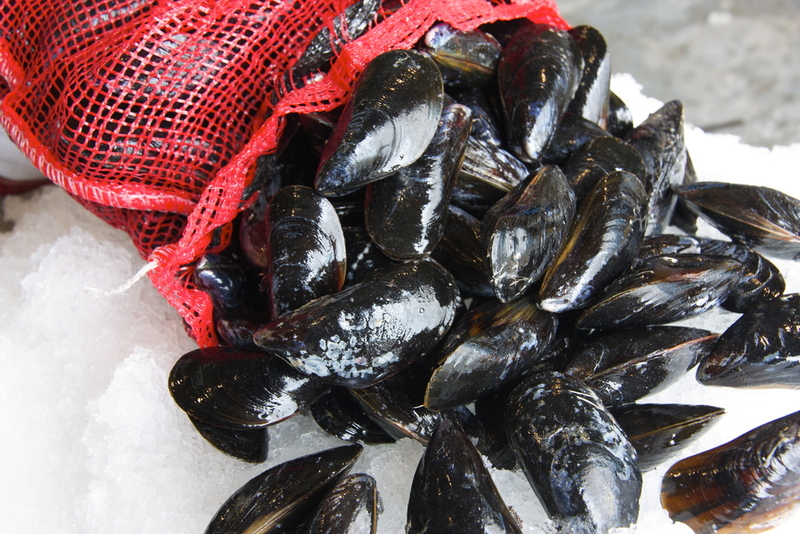 Buy live mussels for wholesale. We carry beautiful Dutch-style mussels from Hollander & de Koning, wild Cape Bay mussels, and rope-grown farmed mussels from PEI. Making Moules-Frites? We've got your fresh live mussels here! H&D Mussels are grown by the DeKoning family in the waters of Mount Desert Island, Maine. The DeKonings, sixth generation mussel farmers, moved to Maine from the Netherlands to continue their mussel growing legacy in the States. Besides their beds in Maine, they also continue to operate farms in Holland. Seed is caught from managed seed beds along the adjacent coasts of Maine. The seed is then spread on private leases where they reattach their byssal threads to the sea floor and to one another. After a year of growth, the mussels are harvested, purged, and de-byssed with a lot of care. The result of all this effort is a superior, bold mussel from Maine. Harvested from Chatham, our Black Gold Mussels are robust beauties that range from 3 to 3.5 inches in size and have full meats. They may be wild, but they are debearded, de-byssed, and purged before being bagged, making it a high quality product that is sure to delight. This is a great wild and local option from Massachusetts.